The DJ-6 barely qualifies as a "Sibling of the CJ-3B." Production of the two models overlapped only slightly, with the long-wheelbase DJ built starting in 1965 and continuing to 1973, according to a brief mention in Jim Allen's Illustrated Buyer's Guide: Jeep . But this is also a Jeep model you don't see very often, and there hasn't been a lot of ink devoted to it in Jeep books, or bandwidth in Jeep websites. So I thought it was useful to provide this look at an excellent example in Jim Marski's Historic Civilian Jeeps Collection in Colorado. 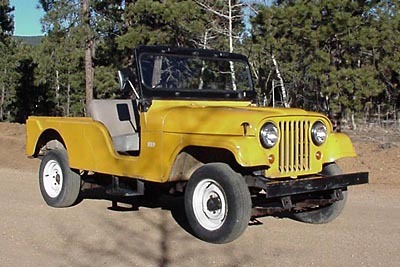 The two-wheel-drive DJ-6 version of the CJ-6 Universal Jeep, had a long 101-inch wheelbase, and was equipped with the F-head 4-cylinder Hurricane, or the V6 Dauntless engine. The right-hand-drive DJ-6 in the Marski collection is a 1968 model in very good original condition, with F134 engine and an automatic transmission. It was built for the Los Angeles, California Park District as one of a handful used exclusively in the parks. The 2-speed automatic transmission is apparently a Borg-Warner gearbox. The shifter is this small lever in the dash, beside the steering column. Click any of the photos to see larger copies (80K JPEGs). Elsewhere on the web, see an Owner's Manual and specs sheet at JeepWillysWorld.com.